Choose an eGift Card No fees! In 1989 Jens Molbak was sitting in his dorm room at Stanford University, staring at a jar of coins on his desk, trying to think of the easiest way he could turn all that loose change into some much-needed cash. He realized that there was simply no way to do it. Founding Coinstar two years later, Jens aimed to create an easy and convenient way for people to turn their loose change into spending money without having to sort, roll, and take it to the bank. Along with two classmates, he built a kiosk that could accurately do all of the hard work. This meant that all the customer had to focus on was how they were going to spend the cash they got back. By 1992, the kiosk was ready for its first installation and Coinstar was subsequently named one of the fastest growing companies in the US. Fast forward to today, and Jens’ vision of helping people make their coins go further is bigger than he could have predicted. 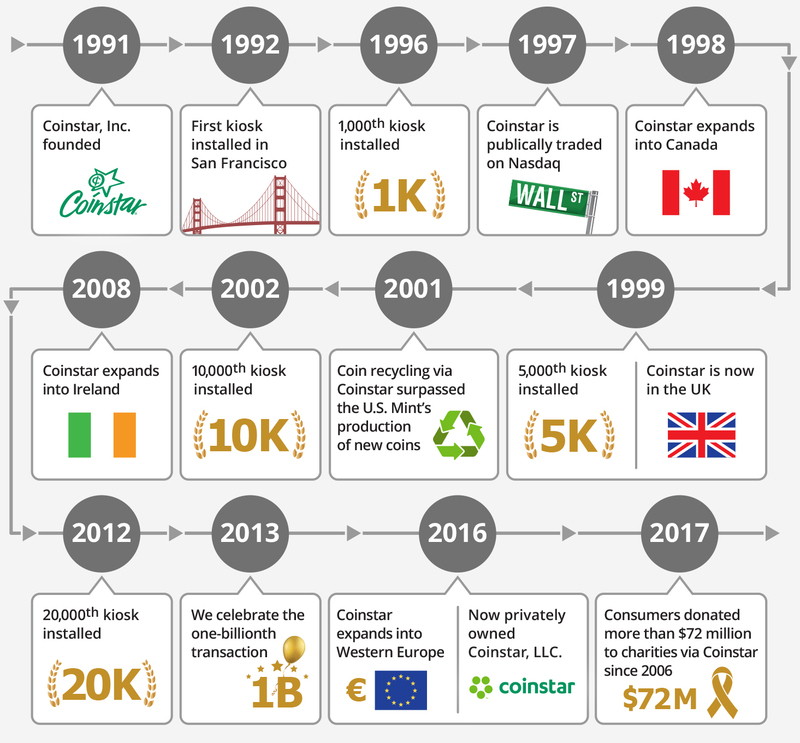 Check out the timeline below to see just a few of Coinstar’s biggest moments. Coinstar® kiosks turn the coins you toss in a jar into something you really want–like cash, a NO FEE eGift Card, or a charity donation. When you visit a kiosk, you get the anticipation, fun, and satisfaction of turning what you aren’t using into something that can make a real difference in your life, right away. It’s fast, easy, and convenient. Stop by a kiosk next time you’re at the store. Copyright © 2019 Coinstar Asset Holdings, LLC. All Rights Reserved. Coinstar and its associated logo are trademarks of Coinstar Asset Holdings, LLC.